More than four decades ago, during the early years of our synagogue, a congregational choir sang during High Holy Day services. We continue the tradition, yet enhance it with newly composed pieces for Rosh Hashanah and Yom Kippur; short-topic programs for special Friday services; an annual full-length spring concert, both sacred and secular; community outreach projects; and a variety of singing opportunities for school aged children. Kol Ami – the voice of our people – describes Cantor Robin Joseph who serves as our “Shaliach Tzibur” – (representative of the community). Cantor Robin arrived at Temple Beth Shalom 30 years ago as a teenager and has led us in song and prayer ever since, in addition to teaching in our religious school, tutoring Bar/Bat Mitzvah students, leading our high school Tikkun Olam program, educating adults...and so much more. Cantor Robin names babies, officiates at weddings and memorial services, leads our Temple Beth Shalom trips to Israel, produces Beit Cafe, and on and on. Ha-or hey-ir et panecha – The light radiates from her face and her voice captures our souls. 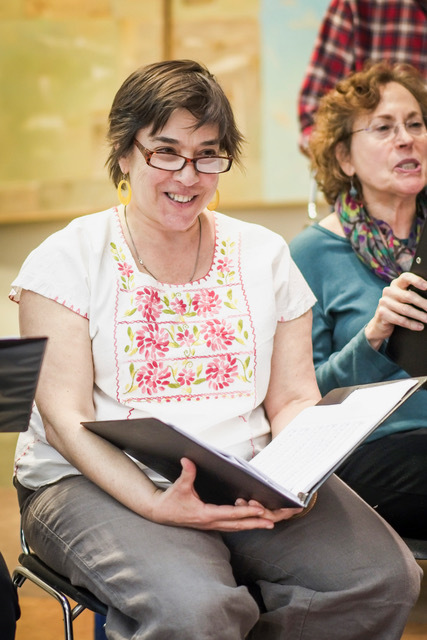 Under the leadership of Linda Moot since 1998, our synagogue choir has become not only a “Chevra” – a friendship circle unto itself – but a source of inspiration throughout the years. Linda beings a professionalism and commitment to Jewish music which has attracted a strong following in our congregation. The High Holidays, the annual choir concert, and the continuing participation in Shabbat services, plus special Choir-To-Go presentations for nursing homes have made our choir a central part of synagogue life. An extremely talented and committed group, the choir has brought our music program to new heights. Music in Our Ears. Time on Our Side. The Coming Year in the Life of the TBS Choir. We began in July by speaking the words of Kol Nidre. Not with the Shofar Blessings of Rosh Hashanah; not with a petition for shelter beneath the wings of God, Hashkiveinu Adonai; not with the beautiful Ozi V’Zim’rat Yah, My Strength and the Song of God Will Save Me; not with the traditional K’dusha, sanctification of time and place. We ignored the order of High Holiday liturgy. Speaking the words of Kol Nidre brings us closer to the meanings of Hebrew syllables, to the rhythms, word emphasis, accents, small silences – all keys to unlocking the glorious melody to come, the most iconic melody of the Days of Awe. Yes, we started with the unconscious breathing of speech, not the more purposeful, deep, yoga-breath of singing. Our New Year, our Teshuvah, our Turning, our special private Yom Tov, started with July’s preparation for Rosh Hashanah and Yom Kippur. Notice for today’s world from Secretary-General of the United Nations, Antonio Guterres: “This year  marks the 80th anniversary of Kristallnacht – the night of broken glass, on which so many Jewish synagogues, shops and other centers of life were destroyed…As terrible as that night was, we know it was a warning sign of far worse to come. And so on this day, we have two fundamental duties: The first is to remember the utter evil and systematic attempt to eliminate the Jewish people. Our second duty is to be watchful of dark clouds on the horizon.” What happened? Racists rose to power. Propaganda, distortion of truth seeped into minds. Ghettos, expulsions and round-ups followed. People were sucked in – perpetrators, passive supporters, victims. We as a nation, as a world, as a community, even as a choir – we all have a special obligation on this day: to not lose sight of what went wrong and how it happened. Music marks history, takes note of it, passes it along – and resonates. A Totally Klezmer Chanukah! Listening, lighting candles, singing, dancing, eating! It’s a Sixth Night of Chanukah Shabbat Party! Our amazing Temple Beth Shalom Klezmer Band welcomes additional enthusiastic instrumentalists to help make the music. Who knew that Woodie Guthrie wrote Chanukah songs? This is a time to forget bad thoughts, to forget even the warring origins and grim tales of the holiday itself, to join together as families and friends — to simply gather, light the lights and smile to each other. In a rare coincidence, on the same evening we will celebrate the Jewish holiday of Tu B’Shvat – Birthday of Trees. Trees, roots, branches. They clean the air, provide oxygen, cool cities and homes, prevent soil erosion and water pollution. Without them life on earth would dwindle, even die. Trees, roots and branches also inhabit metaphors: strength, family, organization, leadership, regeneration, the complexity of human existence. Songs like “There’s a River Flowing in My Soul” and “Roll Down Justice” can live alongside “Eitz Chayim Hi” (She is the Tree of Life) and “Complas de las Frutas” (Song of the Fruits)! Put simply, we should live by just rules and share our fruits. On the Sabbath of Song we will listen to Torah portion that includes the Biblical poem, Shirat HaYam, the “Song of the Sea.” (Exodus 15:1-18) The story, loosely told: Thousands of years ago Israelite slaves, bent and burned from brutal work and desert sun, heard Moses saying, “Go ahead, wade in the water, go ahead, cross on over to the promised land.” And they saw Miriam singing and dancing with her drum, saying “Come on over, Sing to God, Shiru Ladonai, for He has hurled the Egyptians, horses and riders, into the sea!” Amazement at this miracle enters every Jewish service: “Mi Chamocha BaEilim Adonai” – Who is like You among the Gods, Worker of wonders! Our Cantor and Choir will augment the service with additional piyyutim (prayer poems) to reflect the radical turning point of the story. From Slavery to Freedom. Each year, for the final presentation of our season, we seek to breathe life into a stand-out topic of the here and now. This year we look at the arrow of time and specifically our history, the thread it carries into our present (Tradition!) and ahead to the imagined future of our children and grandchildren. Abraham Joshua Heschel gave us a concept of the “architecture of time,” a perfect Shabbat escape route from the material world. But how do we measure a year? A journey through the Torah? Five hundred twenty-five thousand six hundred minutes? In sunsets, cups of coffee, truths learned? Each answer is a rag of time, a piecemeal answer. As to our human selves, we all exist in some kind of time, but none of us alone is a whole piece of cloth. Our story, our history, our future exists as threads of a larger family, a community. is a small community seated within the larger synagogue family. We welcome new singers to join us for any or all programs. Requirements are solely an enjoyment of singing (or playing an instrument) with a group of people and one hour and a half of rehearsal time some weeks of the year. Contact the Choir Director, Linda Moot through lindamoot@tbshastings.org. AN INVITATION TO OUR SINGING COMMUNITY! Our Rabbi tells us that “To Sing is to Pray Twice” – or perhaps a hundred times. Together, both experienced musicians and newcomers bring an added spiritual dimension to our synagogue, for which only a love of singing is required. Our music embraces sacred and secular: traditional liturgy, Eastern European songs, Klezmer revival, exotic sounds of the Middle East; and America’s own jazz, Broadway and folk. If you’re interested in singing with us, contact the Choir Director, Linda Moot through lindamoot@tbshastings.org.